Hammer and percussion drills are primarily used when extremely tough surfaces such as concrete or tile need to be penetrated. These are sometimes referred to as SDS (slotted drive system) hammer drills, as a slotted shank will fit into the end of the drill chuck. The power of vibration is then used to bore through the substance. More Info on SDS Hammer Drills? 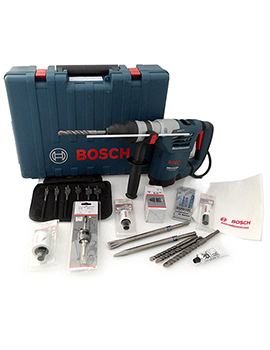 SDS Plus Hammers are a brand manufactured by Bosch. As their branding suggests, they offer several advantages over conventional hammer drills. A brushless motor ensures less wear and tear as well as longer running times. They offer a great performance-to-weight ratio and a proprietary shock reduction system reduces the kickback that the user will experience. What are Max and Hex Demolition Hammers? Max and Hex SDS hammer drills are primarily intended to be used during heavy-duty demolition tasks such as breaking up concrete or separating mortar from rebar. As opposed to offering the user a rotary option, they will mechanically hammer their way through a substrate. Variable speed controls, an ability to rotate the handle 360 degrees and a unique anti-vibration system all provide the user with an enhanced sense of control. Thus, they are often employed for tasks such as breaking up asphalt, scraping floors and inserting ground rods. Hex hammers are equipped with a hexagonal boring shaft. This will help prevent the rod from bending when under heavy loads. As with all types of construction equipment, SDS hammer drills are defined by their intended use. Light-duty requirements may be suited for models such as combination hammers or rotary drills. As we have just seen above, demolition variants should be employed when working with more challenging substances. Other variables to take into account are the total weight of the unit (including the bit), the ability for the handle to swivel, its dimensions, and its power supply. 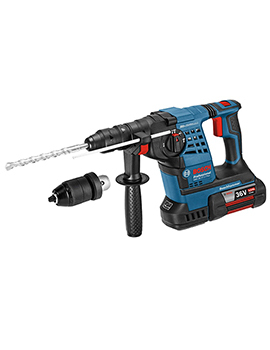 Buildworld supplies a number of high-quality drills manufactured from respected names such as Makita, Bosch, and DeWalt. Quality is therefore never a concern. Demolition hammers, rotary drills, Max hammers and Hex variants are all possibilities. 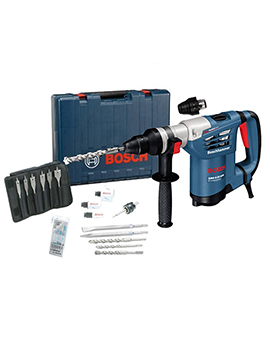 Also, customers can choose a multi-drill which includes accessories such as different types of bits alongside a durable carrying case. To determine the make and model that represents the best option, we encourage you to look at our selection in greater detail. We will be more than happy to answer any additional questions that you may have.